I talk often about how I would much rather give (and receive) an experience as a gift than any material item. Thankfully, my husband, Allen, is on the same page. This past Christmas, when I opened my gift — a trip to the Jerusalem Marathon — I was ecstatic. I’ve always wanted to visit the Holy Land, and to be able to run a marathon there too was beyond belief! My excitement waned when I looked up the itinerary – eight days plus travel. Eek! How could I be gone that long in the midst of my kids’ springtime activities? Mom first, marathon runner and world traveler second. Luckily, Allen hadn’t officially booked my trip. When I shared my concerns, he understood. Even better, he came up with an alternative plan: the Rome Marathon – only four nights away. As they say in Italian, perfecto! 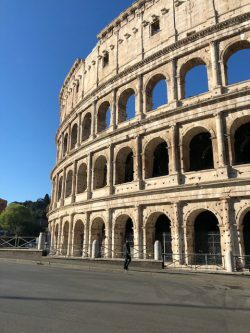 As my trip to Rome neared, I became increasingly nervous. Though I consider myself an adventurous traveler, I don’t travel to other countries by myself very often. Admittedly, traveling to Europe is pretty simple, and I’m becoming more experienced at making this quick trip across the pond. Still, I want to be honest with you guys and say I definitely had some nerves. With the help of a British travel company, Sports Tours International, I secured an entry to Rome Marathon. (The race requires a medical certificate and an Italian run card – a little more entry requirements than what I’m used to.) Sports Tours International also booked my hotel, the Mercure Colosseo. It is very close to the iconic Colosseum, which serves as the start and finish of the race. If you are considering running the Rome Marathon, I’d recommend this hotel for its ideal location. It’s not the most amenity-rich property, but sometimes location is everything. The Rome Marathon is a large, international race with a field of over 13,000 runners. 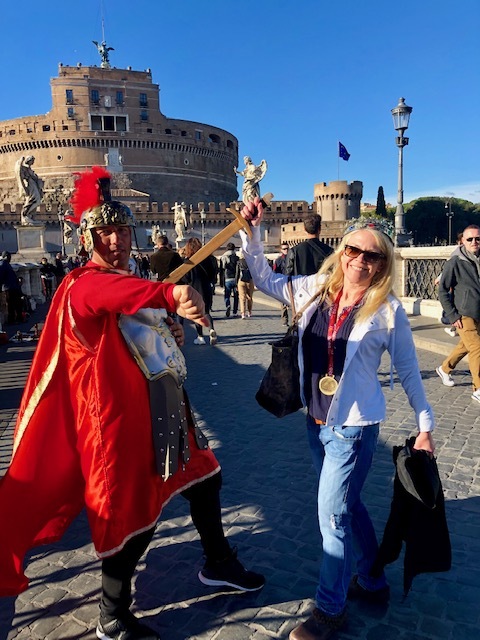 2019 marked Rome Marathon’s 25th year in existence. Despite being well-established, the Rome Marathon (like all races) is not without criticism. I know several runners who dislike the race, saying their race times were affected by cobblestones and tourists. I didn’t care about those things, though, I was determined to just enjoy this Italian experience. 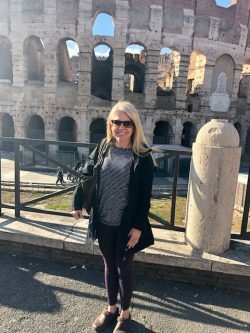 When I landed in Rome, the first item on my agenda was to pick up my race bib. 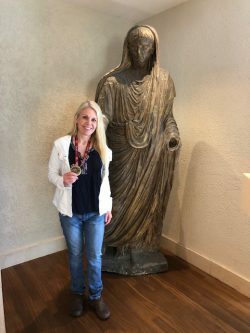 I knew that once I had that task checked off, I was fee to take in as much of Rome as possible. Little did I know that it was going to be a four-hour ordeal. My race information contained two different expo addresses. (One address must have been from a prior year.) I didn’t notice the discrepancy. After traveling by metro and foot for hours to a remote area of Rome, I’m here to tell you the first address listed was definitely not the packet pickup venue. At this point, I was on the verge of tears. Replaying in my mind was my trip from a few years ago to Paris Marathon. (You can read about this near-disastrous trip in my book.) All I could think is that I had traveled too far to have a repeat of my Paris experience. But I pulled myself together. Rather than playing the savvy, international traveler who takes the metro like the locals, I tucked my tail between my legs and flagged down a taxi. Biting my lip, I showed the non-English speaking driver the correct expo address, and off we went. 25 Euros later, my taxi arrived at the expo. It was money well spent. I finally had my packet and was ready to make my Rome trip better. This was not going to be a Paris Marathon trip repeat. At this point, I was really craving a pick-me-up comfort drink from my favorite coffee chain … Starbucks. I thought it was strange that I hadn’t seen any sign of a Starbucks in my escapade to find the expo. How odd. I’ve traveled the world, and I can attest – Starbucks are everywhere. I made my way back to my hotel (via metro – Go, me!) but there was one more twist in store for me. After doing a quick web search, I learned something terrifying. There are no Starbucks in Rome.! Gasp! How was I going to get my “You are here” Starbucks mug? After all, did you really go somewhere if you don’t have that mug to prove it? Thankfully, my trip got better. A lot better. So much better that I’d go so far as to say it was one of my best race weekend getaways. The magnificence of the city’s monuments took my breath away. Yes, Rome has some graffiti problems, but most of the historic structures are so well preserved that I could visualize life throughout periods of time long ago. 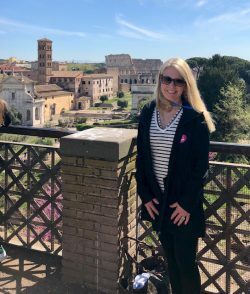 I had pre-booked a guided tour of the Colosseum, as well as a tour of the expansive Vatican City (to include the Sistine Chapel). Between my tours and the use of a Hop On / Hop Off bus, I did everything I wanted to in such a short amount of time. I became so enthralled with the city (and the delicious food) that I quickly forgot about the setback I had at the start of my adventure. When race morning arrived, I felt at ease. There was no time goal bouncing around my brain. Given some of the rumors I had heard about the race, I was planning to just get through it – carefully paying attention to my footing on the cobblestones. My worry about running on cobblestones was exacerbated when I walked out of my hotel to find it was raining. As I cleared race security and made my way to my assigned corral, the rain picked up. Wishing I had brought a poncho, I stood nervously waiting for the race to start, wondering how I would make my way across the slick, wet cobblestones. As I stood waiting, wet and shivering, I became distracted by the opening race ceremony. Distractions can sometimes be a blessing, and this one was just that. The ceremony started with an Italian woman singing the ballad “Never Enough” from the movie, The Greatest Showman. It was such a distraction that, even days later, I’m still scratching my head! If someone can enlighten me on the significance of that song and how it relates to a marathon, please let me know so that I can live out the rest of my life in peace. (Ha!) I can understand the relevance of the Italian national anthem, the next song, but “Never Enough”? Despite the odd song choice and the rain, I couldn’t help but be impressed by how organized the race was. The course starts at the Coliseum, goes out to Vatican City, and returns to the Coliseum. It’s one of the most scenic courses I have experienced. At one point, I literally gasped with amazement. The sights were that incredible. Though the cobblestones were a challenge, they only comprised about a fourth of the course. The “tourists in the way” problem that I had heard about from prior participants was not an issue this year. Almost the entire route was lined with fencing to separate the tourists / spectators from us runners. I have a feeling race organizers have worked hard over the years to improve this aspect. I must admit. It is one of my favorite races to date. Though I had no time goal, I was thrilled to cross the finish line with a time under 4 hours (3:57:04). The authentic cheers of “bravo” were only outshined by the elaborate medal that was hung around my neck. 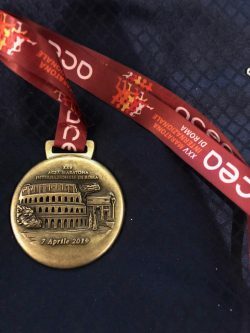 I’m not sure if it is a special medal to commemorate the 25th year of Rome Marathon, but out of the 164 marathon medals in my collection, it is probably my favorite. 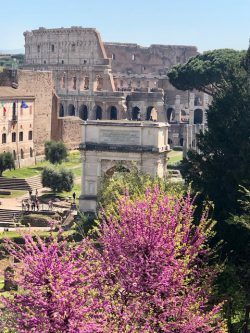 Knowing I had just a few more hours left in the spectacular city of Rome, I continued my sightseeing immediately after finishing race. With real Italian gelato in hand (who needs Starbucks when you have gelato?!? ), I made my way to Castel Sant’ Angelo. Though not as iconic as the Coliseum and the Vatican, I found myself just as impressed by the architecture and history of the castle. The tour of this castle was a really nice ending to a day that I’ll always remember. In closing, I’d like to say thank you to Allen for my great experience in Jerusalem … I mean Rome. Ha! Also, grazie to Rome Marathon organizers and volunteers and the people of the Eternal City. You, Rome, were “more than enough” to make a memory of a lifetime.